This was originally going to be a video review but I did one and it was terrible. So it’s a text review now. Appearance: pale gold with long persistent legs that break up into clingy little bubbles on the Riedel Single Malt glass. Nose: Big peat aroma with a faint whiff of smoke. Burnt butter, a bit of lavender, a bit of sea spray, and maybe heather, though I’m never quite sure what heather is supposed to smell like. On the palate: Full-bodied and buttery. Sweet, creamy butter and wildflower honey, a bit of burn, then the smoke and peat come roaring in on motorcycles like the world’s fattest twins. Finish: The twins barrel right through the finish. The burn follows close at hand and eventually fades into a sweetness in the cheeks and a tingle on the lips. A bit of tobacco smoke lingers in the throat for a long time afterwards. 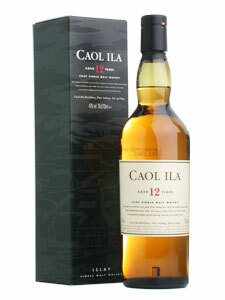 Parting words: The name of this distillery, Caol Ila, means “the straights of Islay”, referring to the straight that seperates Islay from Jura to the east. On the Islay continuum, Caol Ila occupies the place between Lagavulin, which it is slightly milder than and Bowmore, which it is peatier and smokier than. It is also often the single malt which is used in “generic” bottlings of Islay malt. It is thoroughly enjoyable at any time of day (although afternoons work best for me) and I highly recommend it. A friend brought this over the other night–lovely stuff. Unfortunately I had it back-to-back with Talisker 18 so the Caol Ila wasn’t able to shine in its own right. I remember from previous tastings that it’s pretty marvelous too, esp. for the price. Thanks for the review.